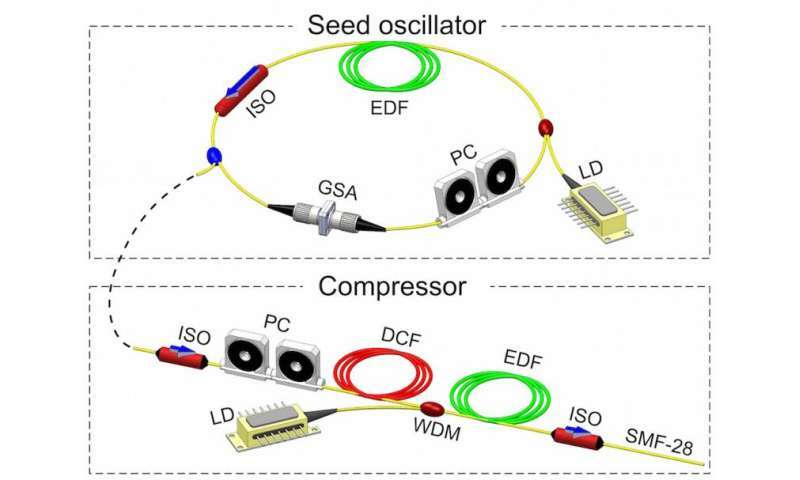 Graphene Flagship researchers have developed an optical fibre laser that emits pulses with durations equivalent to just a few wavelengths of the light used. This fastest ever device based on graphene will be ideal for use in ultrafast spectroscopy, and in surgical lasers that avoid heat damage to living tissue. Advanced photonics applications such as high-speed spectroscopy require ultrashort pulses in order to capture transient physical phenomena in the materials studied. In practice, that means laser pulses in the femtosecond (10-15s) range. An example of such an application is pump-probe spectroscopy of photochemical relaxation processes. "When engineering light to travel in ultrashort pulses, it is important to understand its wave nature," says Daniel Popa, head of the photonics group at the Cambridge Graphene Centre, and leader of its graphene-based laser research project. "For light to propagate as does a mechanical wave on a stretched cord, the shortest possible pulse is defined by a single wave oscillation." Time resolution is limited by the length of the laser pulse used. The shorter the pulse, the higher the spectroscopic resolution, with the highest possible resolution defined by the cycle length of the particular light frequency employed. In the visible and near-infrared regimes, in which most ultrafast lasers operate, the ultimate pulse duration lies between 2 and 5 femtoseconds. Shorter pulses require shorter wavelengths. Theoretical limits aside, pulses as short as two cycles can be generated from laser cavities using a technique known as passive mode-locking. With titanium-sapphire lasers, common in photonics laboratories the world over, pulses of 5 femtosecond length can be produced at a wavelength of 800 nanometres, corresponding to less than two cycles. These pulses are not tuneable, however. Tuneable few-cycle pulses can be achieved by exploiting nonlinear effects in optical parametric amplifiers, but the practical arrangements tend to be complex and expensive. Fibre lasers are attractive platforms for ultrashort pulse generation, owing to their simple, compact and cost-effective designs, their efficient heat dissipation, and an alignment-free operation that does not require bulky optical setups. With fibre-based oscillators, ultrashort pulses can be generated by passive mode-locking, which requires a nonlinear component known as a saturable absorber. Graphene has the ideal physical properties to make such a saturable absorber. Graphene-based mode-locked lasers have been demonstrated before, but it is the use of this novel two-dimensional material in a compact, all-fibre setup that marks the work of Popa and his colleagues. Their advance is outlined in a paper published recently in the journal Applied Physics Letters, the first author of which is doctoral student David Purdie. With fibre lasers, femtosecond pulses are typically generated through soliton mode-locking. A soliton is a self-reinforcing solitary wave that maintains its shape without distortion as it travels at constant velocity along a waveguide such as an optical fibre. Solitons are the result of dispersive and nonlinear effects that cancel each other out in the waveguide medium, thereby allowing a stable pulse envelope to propagate. All-fibre formats are preferable in terms of cost, compactness and robustness, and the strategy here is to use a cavity based on alternating segments of positive and negative dispersion fibres that lead to periodic broadening and compression of the pulses. The key is to extract the pulse from such a cavity when its duration is at a minimum, and peak power thus at a maximum. Owing to the high peak power of the extracted pulse, new frequency components can be generated through nonlinear optical effects within an external length of fibre, and these are critical when it comes to further decreasing the pulse length. This is based on the mathematical relationship in waves between frequency and time domains known as a Fourier transform. To realise this transformation in physical form, the researchers engineered a dispersive delay line that folds the newly created frequency components into a single pulse. The Graphene Flagship researchers' setup was based only on standard telecommunications equipment, with a saturable absorber based on a composite of graphene and polyvinyl alcohol (PVA) fabricated by low-cost solution processing, with the graphene flakes exfoliated from bulk graphite by ultrasonic agitation of the solution. Evaporation leaves behind a 50 micron-thick graphene-PVA composite, which is then sandwiched between fibre connectors. With this setup, Purdie and his colleagues were able to generate 29 femtosecond pulses, which corresponds to fewer than six cycles at a wavelength of 1.5 microns. Compensating for higher-order nonlinear and dispersive effects should lead to a shorter pulse length, and the use of a higher power diode, or a double-pumped configuration, could result in higher bandwidth pulses as well as increased output power. Finally, the addition of photonic crystal fibres could in principle allow for the generation of similarly short laser pulses at other wavelengths. "What is truly remarkable about this project is the ease of combining graphene with off-the-shelf optical fibres in a highly compact format," says Popa. "In this way, we can generate light pulses that last for only a few cycles, or a few millionths of a billionth of a second."